Hundreds of classmates, friends and family members gathered on a Blue Springs soccer field Monday to remember three teens killed in a car crash in Blue Springs Saturday. KANSAS CITY, Mo. 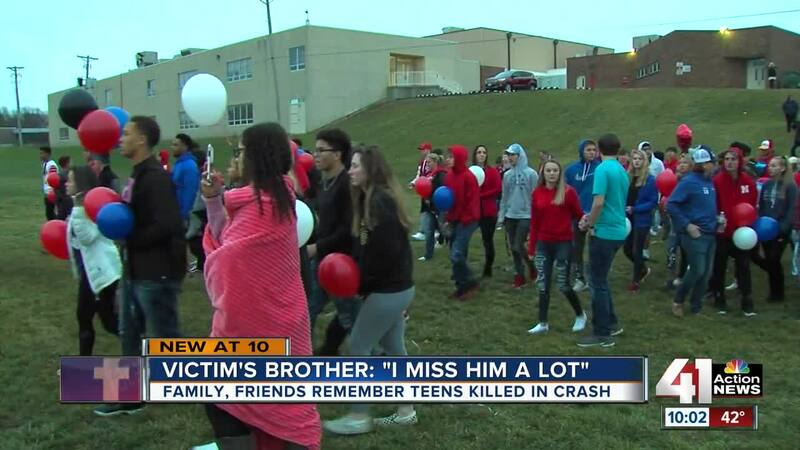 — Hundreds of classmates, friends and family members gathered on a Blue Springs soccer field Monday to remember three teens killed in a car crash. Their loved ones lit candles and released dozens of red, blue and black balloons in memory of the victims. "He was just everyone's best friend. He was outgoing, he was always seeking attention. Everyone wanted to be around him, he made everyone smile," said Patrick Ard. Ard's brother, Nicholas Fordham, was one of the three teens killed. "I miss him a lot," said Ard. Fordham, Darrian Warmack and Kaylen Wright were killed in a two-car crash Saturday night , near Northwest Indian Hills Drive and Northwest Duncan Road. The cause of the car crash is still under investigation.